In modern times most people know amethyst as the February birthstone. However, Amethyst has a rich history in mythology and lore spanning time and the globe. The name is derived from the Greek word amethustos meaning 'not drunken,' although the etiological (origin) story for amethyst was not relayed until 1576 by a French poet named Remy Belleau (Knuth, Gems in Myth, Legend, and Lore, Revised Edition, 2007). Several variations of this story exist, but since I am a romantic, I have chosen to tell the following version...Once upon a time, the Greek god of wine, Dionysus, fell madly in love with a fair maiden name Amethyste who he pursued relentlessly, drunk with love. However, Amethyste refused his advances and wished to remain chaste. She beseeched the virgin goddess, Artemis, to protect her virtue. The goddess, therefore, turned Amethyste into a pillar of white crystal. Dionysus, being humbled by Amethyste's desire to remain chaste, poured wine on the crystals as an offering that turned them forever the color of grapes. In actuality amethyst belongs to the quartz family with the purple color resulting from trace amounts of iron that substitute for silica in the crystalline structure. The iron absorbs certain wavelengths of light, such as yellows and oranges, which causes us to see a purple hue. The iron generally comes from basaltic, iron-rich rocks through which groundwater flows and leaches out the iron and silica necessary to form this purple variety of quartz. However, this knowledge only makes the amethyst origin story more astounding. Quartz is typically colorless or white like the original crystal pillar, and due to its allochromatic ("other colored") nature, it can turn purple through the aforementioned process. The storytellers must have noticed the similar crystal habits and physical properties shared between quartz and amethyst, so they naturally correlated the two in this origin story. Regardless, ancient Greeks and Romans often attributed amethyst the power of sobriety, believing that wearing an amulet of amethyst prevented inebriation. Some anthropologists believe this can be attributed to ancient Romans drinking water from amethyst goblets. The water appeared the color of wine, but one could not get drunk from it. In modern times this belief in amethyst's sobering powers has led to its use in the new age community for alleviating addictions of any kind. 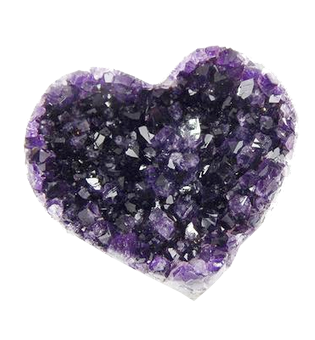 Amethyst's association with the crown chakra in vedic tradition results in its use for intuition, dreaming, spiritual connectedness and general well-being.